2 May - After a brighter day on Wednesday (after a misty start), yesterday was grey wet. Today on the other hand has been very grey but largely dry. Just a brief note about the Sparrows today. No more eggs were laid and the pair are busy incubating their clutch of three. Unfortunately they have continued to bring in nesting material on just about every change-over so that the eggs are no longer visible! I've mentioned before that at the bottom of the garden we have an 5-6ft Oak sapling in a pot. Well we also have another, although this one is no more than a foot tall, and has been laergely ignored, at least until the first half of this week when I took a look at its only cluster of new leaves. 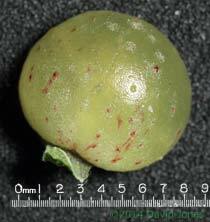 Several have 'currant galls' on their lower surfaces - in the first image you can see one that has developed on an upper surface. These galls are produced by the plant as a result of a gall wasp (in this case probably Neuroterus quercusbaccarum) laying eggs in the leaf buds. 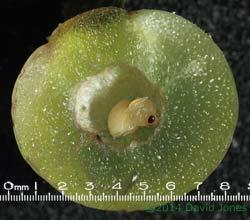 The largest gall of this group measures 9mm across. I first photographed what I believe was an example of an adult N.quercusbaccarum on 22 March. That wasp would have been one of the asexual generation of the species that could well have developed in one of the Common spangle galls that I reported on last September. 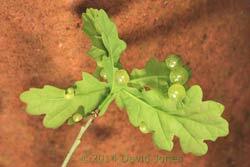 These had developed on leaves of the big Oak sapling during the late summer last year. 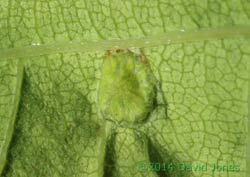 Those galls would have fallen to the ground during the autumn, the asexual adult then emerging from one in the Spring. The currant galls each contain developing male or female wasps that will emerge during the summer and then mate before the female lays fertilised eggs in the Oak leaves. These will induce the growth of another set of Common spangle galls - I shall be watching for these! By a nice coincidence, during a walk in Aldershot park earlier in the week, Evan collected various bits to show his grandma. 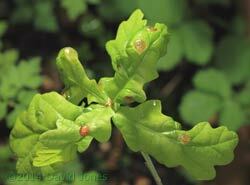 These included a cluster of Oak leaves that had fallen from a mature tree. One one of the leaves there were a couple of Currant galls, one of which was just about the size as the three shown above. Here it is removed from the leaf. I decided to take a look inside. I cut around the soft tissue of the gall and sure enough, there was a healthy looking pupa attached to the side of the cavity. However, it was not alone. There was also a much smaller grub moving about on the exterior of the pupa. You can see it more clearly in this closer image, and as far as I can tell it is the only grub present in the cavity. While the gall wasp pupa is the 'rightful' occupant of the gall, other insects will take advantage of the opportunity to provide food for their offspring. 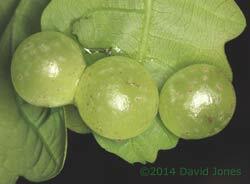 Some, called Inquilines, simple use the shelter of the gall and use it as their food supply. 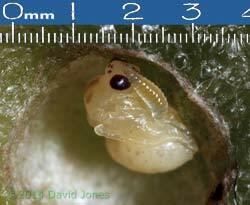 Other insects use long ovipositors to deposit eggs either onto or into the gall wasp larva (or any Inquilines present. The larvae of these parasitoid species than feed on the larvae, killing them in the process. I don't know which of the two categories 'our' grub fits, but the fact that is staying on the pupa suggests the latter, although as I said earlier the pupa does look healthy. I'm storing the gall hemisphere in humid conditions with the cut surface against a microscope coverslip in the hope that I can keep both pupa and grub alive for a while while I watch for any changes that may take place. One of the Oak leaves from the park also carried a different type of gall, much less noticeable thanks to its size and shape. Held up to the light is appeared as though there was a drop of water acting like a small magnifier on the upper surface of the leaf. However, lit from the side it was possible to see it as a small, squat swelling, with a central pimple. 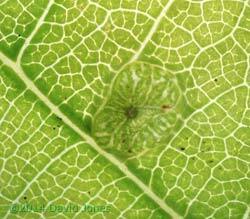 The underside of the leaf had a similar swelling, but with no pimple. 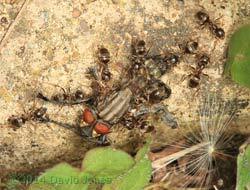 This is the gall of Neuroterus numismalis, another gall wasp with a two generation life-cycle. 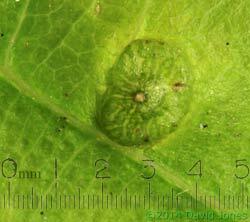 A single larva develops in each gall, producing a wasp of the sexual generation in early summer. Once these wasps emerge they will mate, with the females laying their eggs in the Oak leaves, inducing the growth of Silk button spangle galls in the latter part of the summer. Another plant is flowering as of today (or maybe yesterday?) - the Comfrey. 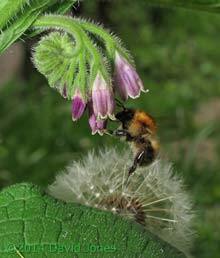 It has already caught the attention of a bumblebee, in this case a Common Carder Bee, a species that is a regular visitor to the Comfrey flowers throughout the summer. And just to finish off, back to our garden path where I found these ants in somewhat of a hurry to get this dead fly across the paving and back into their nest. 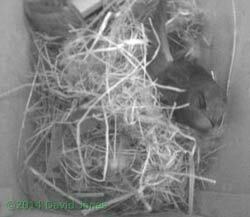 The webcam is now showing the four main Swift boxes, complete with the two Sparrow nests. 4 May - A weekend has passed with two good weather days, which was great for Evan's dad who held a barbeque birthday party for himself and his twin brother on Saturday - a good time was had by all. And today we looked after Evan as his dad finished clearing up! It meant that Evan shared with me a first sighting that he had been looking forward to. 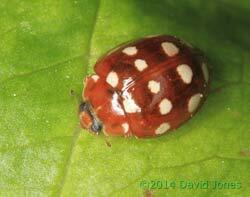 We spotted our first ladybird (he calls them ladybugs - I must change that....) of 2014, a Cream-spot Ladybird. 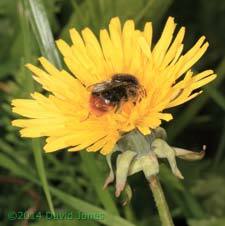 It was good to see a native species and not a Harlequin! We found it on a bamboo leaf, resting in the morning sunshine. Another insect fascinated Evan as it moved between Dandelion flowers and while he remained rather wary he was able to get quite close as it fed. It was a Red-tailed Bumblebee, its small size indicating that it was a worker, the first one that I've seen this year. Another first came in the form of a Flower on the one Smooth Sow-thistle plant that has appeared in the garden this Spring. Sadly, my attempt to keep the Oak gall and its contents came to a premature end today. I checked it early this morning and all appeared to be well, with signs that there had been some progress within the pupa. However, I decided to move the petri dish to a safer spot before Evan came to visit. Unfortunately I carelessly chose a spot which later in the day became exposed to sunlight. The petri dish cover ensured a greenhouse effect and that was that! 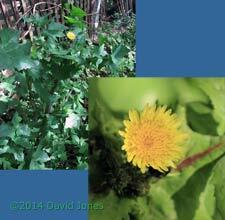 I'll take another trip to the park in the next day or so to collect a few more galls and try again. 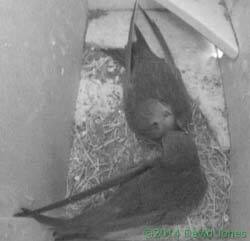 5 May - The first Swifts are back. It was 3pm when a couple of Swifts flew low over the garden, screaming as they passed. Prior to that I hadn't seen any sign of any even high overhead. 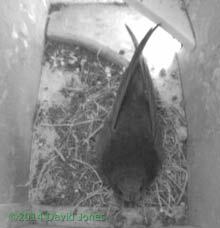 and an hour later it was joined by its partner, both Swifts remaining in the box to roost tonight. 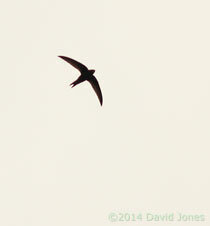 A third Swift returned a short time later, causing chaos in SW(ri). In that box the two Sparrow chicks must have been within a day or so of fledging and had been busy exercising their wings over last two days. In this image you can see one of them perched above the entrance. However, it has now disappeared from there. I'm not sure if it is hiding under the straw or has left the box. I have checked the driveway and I can see no sign of either youngster on the ground. Hopefully they were able to fly to somewhere safe for the night.